Established in 1968, Chobe was Botswana’s first national park; today, it's home to Africa's largest elephant population. The park has a surface area of approximately 11 700km² and stretches from Chobe River in the north, to Khwai river in the south. The park includes the floodplains of the Chobe Riverfront, the Savute Swamp region, and the woodlands in between. The Savute Channel flows out of the Linyanti River in the north and travels through the dry central Savute region, before emptying into the Savute Marsh and Mababe Depression 100km further south. This water is supplemented by the Ngwezumba River, and when the large, flat region fills with water, thousands of migratory birds and animals, especially large herds of zebra, congregate in the area. 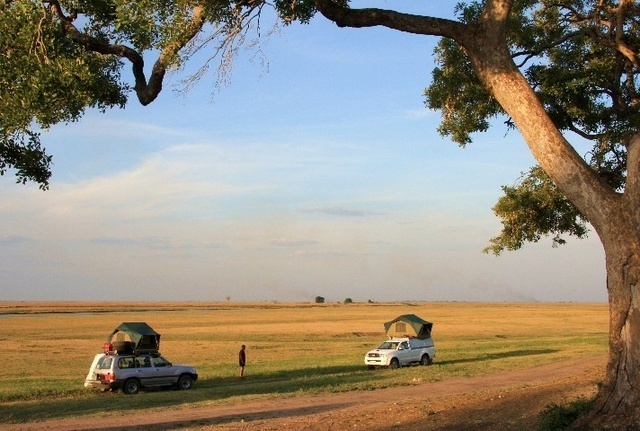 There are various luxury lodges in the park, of which the tented camp at Savuti Restcamp is the most affordable. Camping accommodation is available at Savuti Restcamp but the peak season is fully booked up to a year in advance. The lesser known Linyanti Restcamp, on the banks of the Linyanti river, is a great alternative for travellers who want to camp in the park. While it’s possible to travel through the Nogatsaa area en-route from Kasane to Savuti, there’s no accommodation in this region. There is no petrol, diesel or food supply available in the park, or anywhere between Kasane and Maun. Chobe National Park is a Malaria risk area, it is more frequent during Jan-May in the rainy season. Note that the road between Linyanti and Seronga is a public Transit Road. You do NOT need a permit to use it, unless you want to enter one of the Concession Areas either side of it. For obvious reasons the upmarket lodge owners in this area are not too happy to see self-drive tourists. Be aware that this is not a good road and you have to be very careful of seasonal flooding. Inquire about the road condition from locals shortly before you traverse it and ensure that you have enough fuel to retrace your tracks if necessary. In the rainy season, the eastern track closer to the Chobe Channel may be very muddy, so it's advisable to travel on the western Sand Ridge Road between Savute Camp and Mababe Gate. In the dry season, the thick sand on the Sand Ridge Road, makes for difficult travelling, and it's advisable to travel on the eastern track, closer to the Chobe Channel. There are no formal roads in the park, and its two-spoor sandy / muddy tracks can only accessed by an off-road vehicle. No fuel is available between Maun in the south and Muchenje & Kasane in the north; visitors travelling between Maun and Kasane via Savuti must ensure they're carrying sufficient fuel to reach their destination.